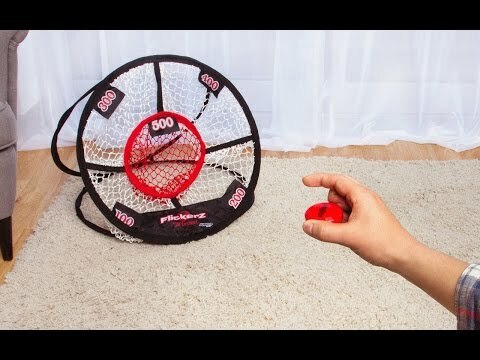 Perfect your finger-flicking skills and work on your shots with this adjustable net. Flick the mini flying discs over obstacles, shoot for a distance record, or use it as a mini game net, inside or outdoors. The bendy legs set up wherever you like, turning any room into a game room. Dimensions: Each Flickerz: 1.6" D x 0.4" H; Net Body: 12" x 5.4" x 1"; Adjustable Legs: 5"; Net: 4" D x 6.5"
My grandson keeps it on his desk and shots from his loft bed, he really enjoys his practice, he loves it. Tweens and early teens are so hard to buy for. My grandson loved this for Christmas! Cool toy! The net is the real genius. It was a little difficult at first but when my grandchildren showed me how to play i enjoyed it. 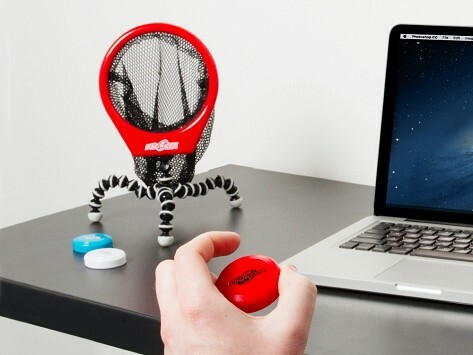 Kids of all ages—even dorm and cubicle dwellers—can get hooked playing Flickerz. Flick the mini flying discs into the net to score points, or practice trick shots to increase distance and accuracy. Place the disc between your thumb and middle finger, and make like you’re snapping your fingers. Once you’ve mastered the flick, you can work on target practice or create your own games. For Founders Mike and Tom, inspiration first struck many years ago. Most of us, as kids, were told not to play ball in the house. But Mike and Tom were banned from playing Frisbee™. Since then, they’ve been working on a mini flying disc game that’s safe to play indoors, and can easily move outside, too. Whether you want to get competitive with some friends, or “attack” your office mates, give it a spin—or rather, a flick.